Today I welcome Sarah Kay Moll to the blog to answer a few questions for Author Interview³. The first thing I wrote that really caught any attention was an essay in the sixth grade about my dog who died. It made my principal cry. In my sophomore year of college, I wrote a grant convincing the University to pay me to write a chapbook of poetry. I imagine they came to regret this, as my poetry is terrible. 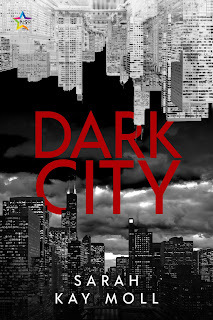 I wrote the sequel to Dark City first, and became so enamoured with my character’s backstory that I just had to write the prequel. 1. Noir, particularly by modern Scandinavian writers like Jo Nesbo. 2. Comic books and graphic novels, particularly the ones starring Batman. 1. A good keyboard. I type very fast and need a light, responsive keyboard. 2. Coffee. And more coffee. 3. Did I say coffee? 1. My desk, which faces a window with a large flowering tree just outside. 2. A nearby coffeeshop—they have a bar with a big window. 3. On my balcony while the cat sits by my feet and stares balefully at dogs walking past. 1. Fan art. Nothing makes me squee harder than when someone does fan art of my characters. 2. A graphic novel adaptation. 3. A blurb from Hanya Yanagihara, Stephen King, or Patrick Rothfuss. 1. Write what you love. You’re going to be doing it for a long time and you might not make much money, so you’d better love it. 2. Get feedback on your writing, ideally from someone who reads a lot. 1. About seven months ago I started a new job as a grant writer, so I’m going to include that and say that I plan to raise as much money as possible for the non-profit I work for. 2. I’m going to continue work on the next two books in the Dark City series. 3. I’m going to start work on the fourth book in the series. Dark City is the end result of four years of obsessive writing. It’s a story about good, evil, and the shades of gray between. It’s a story about love, death, and the possibility (or not) of redemption. I loved it and I hope you do too!